Adapt! It's how your organization's brand can evolve and thrive. Okay, what do those finches have to do with my business? Quite a lot, actually. It’s about their, and your, ability to adapt. Those are the famous Galapagos finches that Charles Darwin studied. He predicted they’d have to adapt and evolve in order to cope with environmental change. He was proved correct*. More to the point, you must adapt for the successful survival of your business in a digital world. Your prospects have adapted to new sources of information, so they can actively ignore all of your “sales” messages. Hello Echo, goodbye radio. Hello Google, goodbye reference books. Hello LinkedIn, goodbye networking club. Prospects don’t answer your voice mail, or respond to your letter, or fish you out of the spam filter because they’re certain they make good buying decisions using their own research – when they’re good and ready. 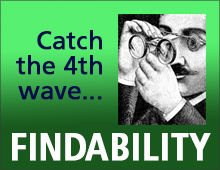 They want to find, not be found. Buyers, not sellers, grip the steering wheel, and control transactions. Deal with it. We adapted, too, evolving from ad agency to branding agency. Advertising is a tactic, no longer a strategy, and declining audiences make old-media ads less cost-effective year after year. (Newspaper readers under 30 are rare.) Any brand using 100% “push” marketing because “that’s the way we’ve always done it” is an endangered species. Must you adapt? Of course. The rules have changed, the tools have changed, and budgets can’t be frittered away on obsolete tactics like printed matter. We’re here to help you evolve. Call. *If you’re curious about the evolutionary importance of those Galapagos finches, there are many good books on the subject. 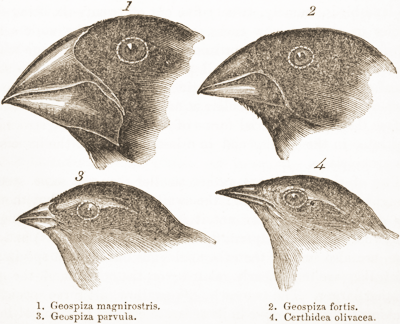 We recommend The Beak of the Finch as a readable text that demonstrates how quickly evolution can take place in times of great change. Here’s a 90-second summary video. Scientists observed a drought, for example, that wiped out the finches’ normal food supply, and 1080 of the 1200 birds on one island died off. The remaining 120 were those with slightly larger beaks, with which they were able to crack seeds and survive. They bred offspring that had (not surprisingly) measurably larger beaks and repopulated within a few short years. Adapt. Evolve. Survive.